Where I belong. : Homeward Bound Part 6. For me today has been a day off. We are in Braunston until at least Tuesday, because we need to collect our spare starter motor from the repairers. This morning we had a relaxing start. In fact it was so relaxed, I did not wake up until 7.50am. We still enjoyed our morning cuppa in bed. Paddy was obviously not in a hurry to go out, because even though we were up, he was still snoozing in his bed. I literally had to wake him up to take him out for his first walk of the day. We had a lovely stroll up the canal in the morning mist. Plan for the day was to have lunch at The Boat House and then to wander to the bottom lock chandlery to get some paint for the roof and gunwales, but before any of that, I sorted the stove out in the saloon, I did not bother with the back cabin stove, because it was going to be warmer. I made us some toast and then fed Paddy. He has taken to being fussy with his food again and the only way we can get him to eat it, is to squeak his ball and put it near his bowl. He seems to think the ball is going to eat his food, so he then snaffles it down, before his ball gets it. I have no idea what goes through his brain, but at the moment it is strange things. Still if it makes him eat, I will go with it. After morning coffee, I got on with more crocheting. 12 noon, we set off for the pub and a pint. They had a carvery on, so we decided a nice Sunday roast was called for. It comes as part of the 2 for 1 meal deal, so happy days. £14.25 split in two plus two pints of Hobgoblin scrummy. The carvery was extremely good and I can recommend it. After lunch we walked down to the bottom lock chandlery to see if they had any Epifanes Red-Brown paint. I need it for next Spring, because I will have the roof, back counter and forend to paint when we go into dry dock next year and we will not be coming this way. I did look online to see if I could get it cheaper, but no go. Having broken the bank to pay for it, we strolled to the Canal Shop by the bottom lock and I treated us to an ice cream each and we enjoyed a lovely natter with the shop owner. That little shop is a wonder and you can even get fresh bread there. On the walk back to the boat, we bumped into Jenni our friend, who was out walking her dog and she has offered to take us into Daventry to get our starter motor, which is incredibly kind of her, so that is a job for the next couple of day I expect. Back home, Paddy required a walk and his lunch. 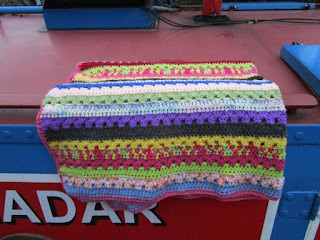 I then finished blanket number 8 for the Border Collie Trust. I have had an offer of some wool, if I can collect it on our way home, so that will be my task. I have sent of three blankets so far and have another five to go when we get home. The wool bag is getting low, so I look forward to receiving new wool to work with. Over a coffee, we stood and nattered to Sheila and Jim on NB Islonian. It is always nice to put the world to right and have a laugh. At the moment the generator is on, to charge the batteries. It will be time for coffee soon and also time for me to put my feet up. Homeward Bound Day 9. Home. Visit over for another year.